Final Fantasy VII Remake producer Yoshinori Kitase confirmed in a recent interview that legendary composer Nobuo Uematsu is in fact working on the upcoming remake. It’s currently unknown how involved he is, but in the past he supervised the soundtracks in the remakes of Final Fantasy II, Final Fantasy III and Final Fantasy IV along with the HD remaster of Final Fantasy X so it would seem the most likely. 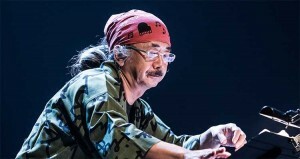 The song used for the latest trailer at PSX 2015 was composed by Uematsu’s Distant World team. It’s also possible he might compose the theme song, something he has also done previously in the remakes of Final Fantasy III and Final Fantasy IV along with the original Final Fantasy XII.